With only a few days left in 2009, it's time once again to look back at what an awesome year it was. There were plenty of great co-op games to play, brand new franchises were born, and tons of great content was made available for games. All in all, looking back, it almost feels like there was more gaming than one person could digest. 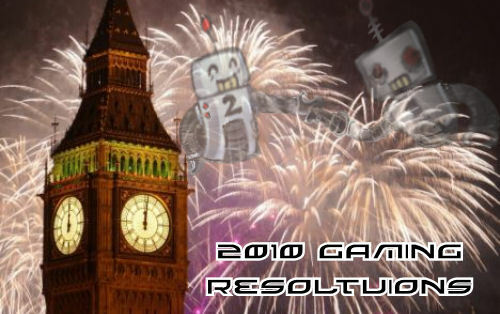 With that said, the Co-Opticrew has put together their New Year's gaming resolutions for 2010. Jim McLaughlin - "I plan to jump on board the digital distribution bandwagon more in 2010. I haven't purchased anything from PSN for my PSP-3000 yet, and I haven't really taken advantage of Steam at all. Also, there are some great-looking indie games on Xbox Live that I have to try." Mike Katsufrakis - "Considering money will be much tighter for me in 2010 than it has been in the past, I hereby resolve to attack my pile of shame, mostly games from late in the last generation. I also have a considerable pile of DS and PSP games to get through, so I'm going to be quite busy"
Marc Allie - I've got my PC hooked up to my HDTV now, so my gaming resolution is to do a bit more PC gaming. The recent Steam sales mean I have plenty of games to start enjoying right now! Jason Love - Like Mike, I resolve to finally weedle my way through my large pile of bought but barely played games. I'm also hoping to engage a little more in some co-op play with our Co-Optimus community. Katrina Pawlowski - For 2010 I hope to write and share a lot more of my gaming experiences like I used to. For as much as I game now, I don't share nearly as often as I once did. I feel that writing my gaming experiences in a journal or blog will allow me experience a game more intimately than simply finishing it, as well as sharing the experience with fellow gamers. Nick Puleo - I plan on completing more games, while not playing as many games. I also plan on spending time with a wider variety of games on a wider variety of platforms. What's your New Year's Gaming Resolution for 2010? Page created in 0.7385 seconds.